Work on the backup system to provide alternate cooling water to the RPVs is ongoing. 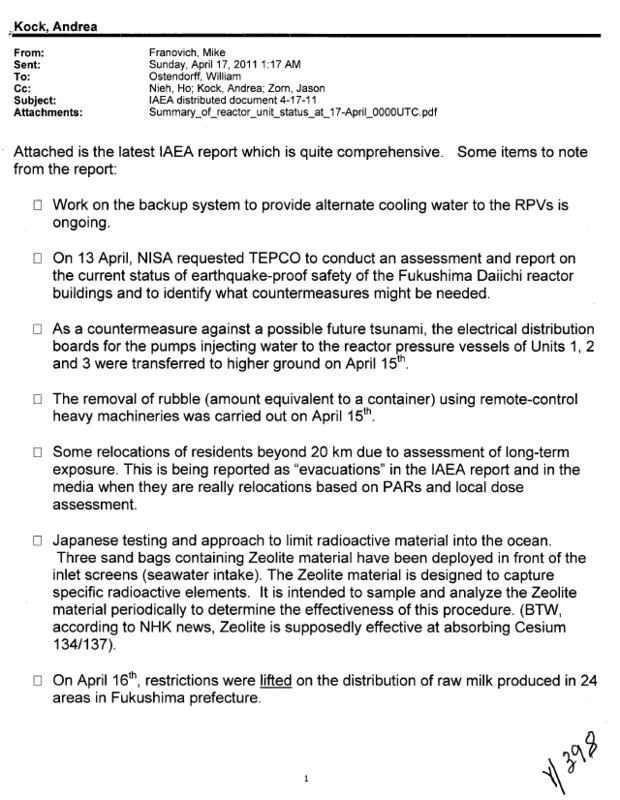 On 13 April, NISA requested TEPCO to conduct an assessment and report on the current status of earthquake-proof safety of the Fukushima Daiichi reactor buildings and to identify what countermeasures might be needed. Some relocations of residents beyond 20 km due to assessment of long-term exposure. This is being reported as “evacuations” in the IAEA report and in the media when they are really relocations based on PARs and local dose assessment. Japanese testing and approach to limit radioactive material into the ocean. Three sand bags containing Zeolite material have been deployed in front of the inlet screens (seawater intake). The Zeolite material is designed to capture specific radioactive elements. It is intended to sample and analyze the Zeolite material periodically to determine the effectiveness of this procedure. (BTW, according to NHK news, Zeolite is supposedly effective at absorbing Cesium 134/137). On April 1 6 th, restrictions were lifted on the distribution of raw milk produced in 24 areas in Fukushima prefecture.